I’ve said goodbye to many animals in my lifetime. Those farewells have taken place at different times of the year, but never during the Christmas season. It was close, once, back in 1993. My sweet dog, Jessie, spent much of the week before Christmas in the hospital as several of her organs began to fail simultaneously. She came home on December 24th, a shadow of her former self….but she DID come home. The vet said the only reason she was alive was because she wanted to come home for Christmas. 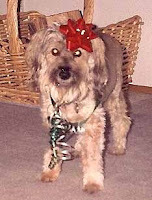 Jessie left me three months later, so I was spared the heart-wrenching loss of my four-legged friend at the holidays. painful loss of a critter at this time of the year, when everyone around you seems to be in a festive mood. Holiday movies run non-stop on television. School groups sing seasonal songs at the mall. Cards arrive, wishing you Ho Ho Ho Happy Holidays. I wish I knew a magic word, or secret ritual, that would soften the grieving process. For some people, relying on their friends, family and faith can be a tremendous source of comfort. For others, staying close to home…alone…is all they can manage. That’s fine, too. I wrote about this at my website, in a section called Grieving – How Do You Cope with the Loss of a Pet? It still brings tears to read the words I wrote about the loss of my forever dog, Jake. But I also find hope in those words. Perhaps others can find hope there, too. If you’ve lost a critter at this time of the year, know that you are in my holiday heart and prayers in the weeks to come. What a lovely, and timely, article. I lost Buckley, the subject of my book Buckley’s Story – Lessons from a Feline Master Teacher, last Thanksgiving. It was the first time I’d lost a pet during the holidays, and it made for a very difficult grieving process. I was fortunate that I have friends who accepted my need to just be alone much of the time and didn’t force me to make merry when that was the last thing on my mind. This year, Thanksgiving was hard, as first anniversaries always are. I think Christmas might be just a little bit easier, but I still miss her terribly. My heart goes out to everyone who loses or has lost a pet during the holidays. Ingrid, I’m so sorry you had to experience the loss of Buckley during the holidays. I’m sure this past Thanksgiving was very difficult. I hope this Christmas you’ll be able to celebrate your beloved Buckley, and remember all the magical moments you two shared. Your love will keep your connected…furever!